James McHenry was an American statesman during early 19th century. He was born on November 16, 1753 and died on May 3, 1816. He was one of the signers of the United States Constitution, from Maryland. Fort McHenry was named after him, and it was the bombardment of this star-shaped fort that served as the inspiration for the American national anthem, "The Star-Spangled Banner". McHenry attended the Continental Congress as a delegate from Maryland, and served as the third Secretary of War of the United States from January 27, 1796 to May 13, 1800, under the Presidents George Washington and John Adams. McHenry came from a Scots-Irish family, and was born in 1753 in Ballymena of Country Antrim, Ireland. At Dublin, received a classical education, and later became a poetry writer. In 1771, he moved to Philadelphia in the United States. In Philadelphia he became a physician, and was received a medical education under Benjamin Rush. McHenry also ran a trading business with his brother in Baltimore. McHenry came to the notice of President George Washington due to his expertise, dedication and contribution as a surgeon during the Revolutionary War. Washington promoted him to serve as an aide in 1778, just before the Battle of Monmouth took place. McHenry served as a brave and loyal aide for two years under President Washington, before leaving the army in 1781. McHenry took part in the drafting of the US Constitution, alongside two other physicians Hugh Williamson and James McClurg. He played an important role as Secretary of War during the presidency of John Adams. When he came to office, Adams wanted to keep the cabinet serving under him together. However, there were three cabinet members who undermined Adams' administration. These cabinet members included McHenry, Timothy Pickering (Secretary of State), and Oliver Wolcott (Secretary of the Treasury). McHenry, Pickering and Wolcott paid more attention and listened to Adams' opponent Alexander Hamilton than to Adams. The three cabinet members disagreed with Adams in public, and rather than resigning from their positions, they stayed in cabinet, working in opposition to Adams' policies. It is not known whether Adams was aware of the disloyalty of McHenry, Pickering and Wolcott to his office. At the time of the 1800 Presidency election, McHenry motivated Adams' adversary Hamilton to reveal his criticism against the President. Hamilton questioned Adams' loyalty and patriotism to the country, and criticized his policies. This caused public disputes over the major Presidential candidates for the election and ultimately led to Thomas Jefferson being elected as President in 1801. 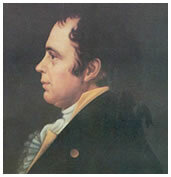 In 1800, McHenry was replaced as a cabinet member by Adams. This was not due to his incompetence as a cabinet member, but was because McHenry himself resigned from his position. Secretary of State Pickering and Secretary of the Treasury Wolcott also resigned from office. In McHenry's place, Samuel Dexter was appointed as the 4th Secretary of War by Adams. While McHenry was personally liked by many individuals, his incompetent administration during his role as Secretary of War earned him criticism from certain individuals. Amongst the criticism he received, included frequent complaints from Washington, Hamilton and Wolcott.